Recently, both sides involved in the fighting in Syria have accused the other of chemical weapons (CW) use. Remnants of similar items were found in two alleged chemical attacks in Saraqeb, Idlib and Sheikh Maqsoud, Aleppo. Eliot Higgins has gone into a little more detail on the items in question. Whilst the munitions can not be conclusively identified, they do not appear to match any known CW delivery devices, including known smaller devices intended for special operations. 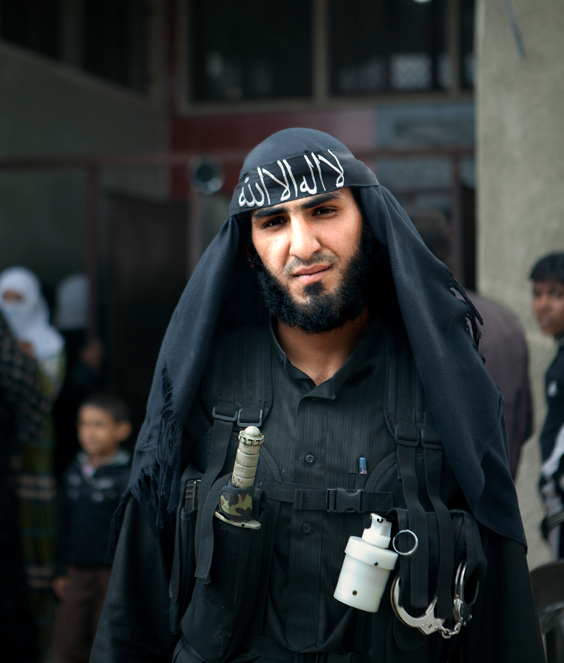 Less than an hour ago, Jeffry Ruigendijk published a series of photos on his website, showing a fighter from the Al-Nusra Front (an Al Qaeda-associated rebel group in Syria) with what appears to be one of the grenades in question. Whilst not matching any CW delivery devices known to me or to the CW specialists I spoke with, the munitions do appear quite similar to those produced by the Indian Border Security Force’s Tear Smoke Unit (TSU), at their plant in Tekanpur, Madhya Pradesh. 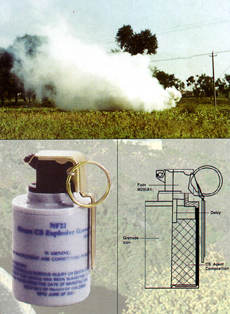 Several of their production items appear to share physical similarities with the unidentified grenade, but the closest visual match is their ‘Tear Smoke Chilli Grenade’, seen below. 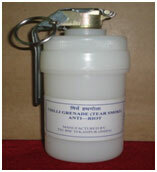 This grenade contains a combination of CS gas ( 2-chlorobenzalmalononitrile) and ‘synthetic chilli’ (likely a synthetic capsaicin, such as nonivamide) – both common riot control agents. Whilst this is certainly not an exact visual match, it may point to similarities present in other (perhaps older or newer) products which TSU manufactures, or copies, variants, or similar munitions produced by other countries. 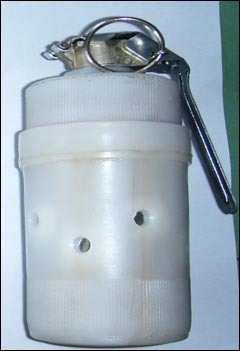 The white plastic-cased grenade in the image at top does not feature any discernible markings, which is possibly consistent with the removal of the adhesive labels seen on TSU’s products. The safety lever (AKA ‘fly-off lever’ or ‘spoon’) appears to be of similar design, although there appear to be differences in the fuze design. This Indian news article notes that Turkey purchased 10,025 munitions from TSU in 2007, which may indicate a possible avenue of supply, particularly if the grenades were in the hands of rebel forces, as the image at top appears to indicate. Of course, this grenade remains unidentified, and we cannot conclusively rule out the use of CW, but it seems increasingly less likely that chemical weapons were used in the two attacks in question. Update 09/05/2013: Benjamin Hiller has forwarded me a link to the Nanxing Chemical General factory in China, who also offer a squat, plastic-cased riot control grenade. This product appears to combine the effects of a flashbang grenade with CS gas. Whilst, again, this is certainly not an ID, it does show similar products being produced in China, who are known to have supplied numerous arms and munitions to Syria. He noted that their OC-based munitions are provided to the Indian Army and internal security forces in India, although the devices are available for export. My thanks to Mike Weber, Eliot Higgins, Benjamin Hiller, as well as a CW specialist who wishes to remain unnamed. A special hat tip is due to Aris Roussinos, who pointed us all in the direction of TSU. I have emailed the BSF, and the TSU specifically, and asked them for assistance in identifying these munitions and any possible diversion. This post will be updated to reflect their reply, if any. Should anyone recognise the grenade pictured, or have any other suggestions for identification, please get in touch. I am sorry, the info contained in/via the above is scattered about a bit; but, it’s there. Pressures prevent me trawling back and summarising, at this precise juncture. I have often wondered, in the current context, what the Russians used to end the 23/26 October 2002 siege at the Dubrovka Theatre Centre (Театрального центра на Дубровке), Moscow, Kolokol-1 (Колокол-1)) the item most often cited. There’s brief reference to it at the bottom here: http://ceaccp.oxfordjournals.org/content/6/6/230.full.pdf. The wiki itemising the various possibilities, including Kolokol-1, and linking to further articles/items elsewhere is here: http://en.wikipedia.org/wiki/Moscow_hostage_crisis_chemical_agent. Clearly an incapacitating agent bordering on or, given minority circumstances, crossing into lethal, whatever it was. I have attempted a summary of the current, general chemical situation in Syria here: http://yallasouriya.wordpress.com/2013/05/10/direct-links-to-the-two-nbc-videos-of/. Wasn’t the chemical confirmed to be 3-Methylfentanyl, a analogue of the opiate analgesic Fentanyl? 10-15 times more potent than Fentanyl is outrageous. I don’t know what the Russians were thinking using it seeing as how they had so many hostages of whom varied in age and health wildly.